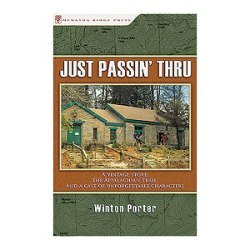 Just Passin' Thru, by Winton Porter, 2009. A witty and uniquely entertaining book written by the owner of an outfitting shop, Mountain Crossings, set right on the Appalachian Trail near its southern end in Gerogia. Porter chronciles his interactions with the many colorful characters who pass through his store, and sometimes return again and again, in a sort of daily AT reailty show. Great reading. 264 pp, 5 1/2" x 8 1/2."